The debating stand was erected against this end of the building. This photo was published in 1908. Note: The caption in the book states this is the west end of Old Main. Thanks to Bill McKie for bringing the error to our attention. A careful study suggests this is indeed the east end of Old Main--note the bald trees and long shadows, which in Illinois could only occur if the pillars are on the south side of the building. Thanks also to Scott Harrod for helping us find the answer. 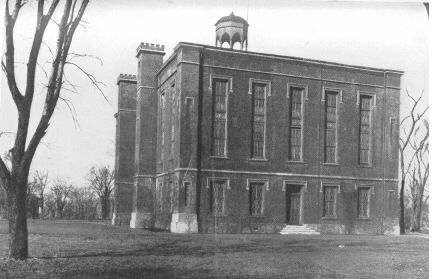 Photo from: Collections of the Illinois State Historical Library Vol. III, Lincoln Series, Vol. I, The Lincoln-Douglas Debates of 1858. Edited by Edwin Erle Sparks, Ph.D. Published by the Illinois State Historical Library, Springfield, IL, 1908.